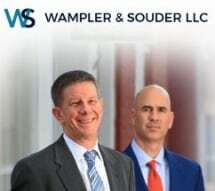 At Wampler & Souder LLC, we provide high-quality legal services to Maryland clients throughout Montgomery, Frederick, Washington, Prince George’s, Carroll, Howard and Anne Arundel counties. When clients turn to the team at our Silver Spring law office, it is with the confidence that we will provide experienced guidance and knowledgeable counsel during some of life's most complex situations. Our law firm currently offers legal services in cases pertaining to personal injury, family law, bankruptcy and more. We use our extensive knowledge and resources for the benefit of our clients, seeking positive results in every case we take. Our team will work to develop an effective strategy tailored to your goals and objectives for your unique situation. We pride ourselves on taking a personal approach to every case. We look closely at your situation, carefully evaluating every factor, and we leverage the skills and abilities of every team member at our law office in order to get you the best results possible. When there is much at stake, experience and dedication matter. Facing legal challenges is daunting, but you do not have to navigate your current concerns alone. We work tirelessly on your behalf, fighting for your best interests and ensuring full protection of your rights from the very beginning of your case. Please contact us for an initial consultation by scheduling an appointment with a member of our team at your earliest convenience.